Windsors Finest Football Academy hasn't added a story. My name is Talin Parr and for those of you who don't know me i have been growing my hair for 2 years and its time to cut it. We will be doing a cut on November 15/2015 at John Max Sports Bar on Dougall rd. Windsor Ontario. The hair will be donated to the Cancer Society and I am looking to raise funds for Windsors Finest Football Academy. 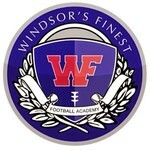 Windsors Finest Football Academy is a local organization that runs football camps for youth throughout Windsor and Essex County. It allows youth in the city the opportunity to work with professional athletes like Tyrone Crawford, Daryl Townsene and Luke Willson. I believe it is important for youth to be able to participate and experience something like this as it can shape many youths lives and thoughts. Windsors Finest Football Academy hasn't posted any updates yet. Windsors Finest Football Academy is managing the funds for this campaign.